The video clips on this website use the Quicktime plugin. Get it free here! and slides are now online. One World One Health Research Projects Funded by Cargill"
About "One World, One Health"
Health experts from around the world met on September 29, 2004 for a symposium focused on the current and potential movements of diseases among human, domestic animal, and wildlife populations organized by the Wildlife Conservation Society and hosted by The Rockefeller University. Using case studies on Ebola, Avian Influenza, and Chronic Wasting Disease as examples, the assembled expert panelists delineated priorities for an international, interdisciplinary approach for combating threats to the health of life on Earth. 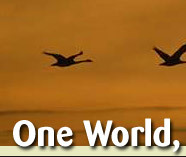 The product—called the “Manhattan Principles” by the organizers of the “One World, One Health” event, lists 12 recommendations (see below) for establishing a more holistic approach to preventing epidemic / epizootic disease and for maintaining ecosystem integrity for the benefit of humans, their domesticated animals, and the foundational biodiversity that supports us all. Representatives from the World Health Organization; the UN Food and Agriculture Organization; the Centers for Disease Control and Prevention; the United States Geological Survey National Wildlife Health Center; the United States Department of Agriculture; the Canadian Cooperative Wildlife Health Centre; the Laboratoire Nationale de Sante Publique of Brazzaville, Republic of Congo; the IUCN Commission on Environmental Law; and the Wildlife Conservation Society were among the many participants. Recent outbreaks of West Nile Virus, Ebola Hemorrhagic Fever, SARS, Monkeypox, Mad Cow Disease and Avian Influenza remind us that human and animal health are intimately connected. 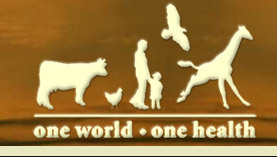 A broader understanding of health and disease demands a unity of approach achievable only through a consilience of human, domestic animal and wildlife health - One Health. Phenomena such as species loss, habitat degradation, pollution, invasive alien species, and global climate change are fundamentally altering life on our planet from terrestrial wilderness and ocean depths to the most densely populated cities. The rise of emerging and resurging infectious diseases threatens not only humans (and their food supplies and economies), but also the fauna and flora comprising the critically needed biodiversity that supports the living infrastructure of our world. The earnestness and effectiveness of humankind’s environmental stewardship and our future health have never been more clearly linked. To win the disease battles of the 21st Century while ensuring the biological integrity of the Earth for future generations requires interdisciplinary and cross-sectoral approaches to disease prevention, surveillance, monitoring, control and mitigation as well as to environmental conservation more broadly. 1. Recognize the essential link between human, domestic animal and wildlife health and the threat disease poses to people, their food supplies and economies, and the biodiversity essential to maintaining the healthy environments and functioning ecosystems we all require. 2. Recognize that decisions regarding land and water use have real implications for health. Alterations in the resilience of ecosystems and shifts in patterns of disease emergence and spread manifest themselves when we fail to recognize this relationship. 3. Include wildlife health science as an essential component of global disease prevention, surveillance, monitoring, control and mitigation. 4. 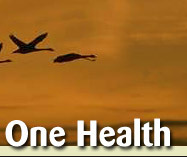 Recognize that human health programs can greatly contribute to conservation efforts. 5. Devise adaptive, holistic and forward-looking approaches to the prevention, surveillance, monitoring, control and mitigation of emerging and resurging diseases that take the complex interconnections among species into full account. 6. Seek opportunities to fully integrate biodiversity conservation perspectives and human needs (including those related to domestic animal health) when developing solutions to infectious disease threats. 7. Reduce the demand for and better regulate the international live wildlife and bushmeat trade not only to protect wildlife populations but to lessen the risks of disease movement, cross-species transmission, and the development of novel pathogen-host relationships. The costs of this worldwide trade in terms of impacts on public health, agriculture and conservation are enormous, and the global community must address this trade as the real threat it is to global socioeconomic security. 8. Restrict the mass culling of free-ranging wildlife species for disease control to situations where there is a multidisciplinary, international scientific consensus that a wildlife population poses an urgent, significant threat to human health, food security, or wildlife health more broadly. 9. Increase investment in the global human and animal health infrastructure commensurate with the serious nature of emerging and resurging disease threats to people, domestic animals and wildlife. Enhanced capacity for global human and animal health surveillance and for clear, timely information-sharing (that takes language barriers into account) can only help improve coordination of responses among governmental and nongovernmental agencies, public and animal health institutions, vaccine / pharmaceutical manufacturers, and other stakeholders. 10. Form collaborative relationships among governments, local people, and the private and public (i.e.- non-profit) sectors to meet the challenges of global health and biodiversity conservation. 11. Provide adequate resources and support for global wildlife health surveillance networks that exchange disease information with the public health and agricultural animal health communities as part of early warning systems for the emergence and resurgence of disease threats. 12. Invest in educating and raising awareness among the world’s people and in influencing the policy process to increase recognition that we must better understand the relationships between health and ecosystem integrity to succeed in improving prospects for a healthier planet. It is clear that no one discipline or sector of society has enough knowledge and resources to prevent the emergence or resurgence of diseases in today’s globalized world. No one nation can reverse the patterns of habitat loss and extinction that can and do undermine the health of people and animals. Only by breaking down the barriers among agencies, individuals, specialties and sectors can we unleash the innovation and expertise needed to meet the many serious challenges to the health of people, domestic animals, and wildlife and to the integrity of ecosystems. Solving today’s threats and tomorrow’s problems cannot be accomplished with yesterday’s approaches. We are in an era of “One World, One Health” and we must devise adaptive, forward-looking and multidisciplinary solutions to the challenges that undoubtedly lie ahead.